Influence of Fe substitutions by rare-earth (La3+) ions on structural, electric, dielectric and magnetic properties of cobalt ferrite employing glycine nitrate method is investigated. The FTIR spectra and Mossbauer spectroscopy measurements illustrate spinel phase formation of CoFe2−xLaxO4 nanoferrites supporting structural analysis from X-ray diffraction patterns. Magnetic analysis revealed that with increasing La concentration to 0.1, the coercivity and squareness values increased from 1958 to 3312 Oe, and 0.52–0.57, respectively. 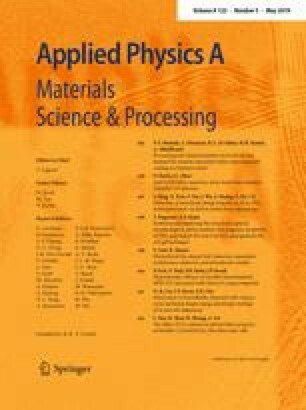 To obtain accuracy in the saturation magnetization values, a theoretical approach was used considering the ferromagnetic (FM) and antiferromagnetic/paramagnetic (AFM/PM) components. Dielectric measurements studied in the range of 100 Hz–1 MHz frequency from room temperature to 300 °C indicated enhanced dielectric constant with low loss on increasing La3+ concentration. The ferrite nanoparticles with improved magnetic and dielectric properties make these materials suitable for magneto-recording and high-frequency devices. Ms. Krutika L. Routray acknowledges Department of Science & Technology, India, for fellowship Grants under INSPIRE scheme with sanction number DST/INSPIRE Fellowship/2014/IF140812 during her research work. Magnetisation study has been supported by VSM, DST, India, project code “EMR/2014/000341. We would like to acknowledge Dr. Dirtha Sanyal, VECC, Kolkata, for Mossbauer spectroscopy measurements.